When thinking brings pleasure. When thinking brings pleasure? : Why Americans Are Starting To Lose The World Race For Prosperity? Why Americans Are Starting To Lose The World Race For Prosperity? The World Race For Prosperity? First, I would like to note that I don't talk about America as a country. I talk about Americans - people who have been born here, in America. I talk about Americans in forth, third, maybe even second generation. Many of those people grew up with a sense of entitlement for having a good life, but then met face-to-face with harsh realities like student loans, unreachable housing, absence of any savings, super-expensive medical treatment, etc. At the same time, the population in some old and new rivals or allies, like Russia, China, Brazil, India has been enjoying gradual economic improvement. However, despite the decline in well-being of many American-born Americans, the strength of America as a country as a whole is being supported by the influx of affluent immigrants. Secondly, “starting to lose” does not mean that the loss is inevitable. For example, in sport there have been many instances when an athlete or a team would come to a victory from behind. This piece came to life as a reaction to a post I stumbled-upon on when checking LinkedIn. Someone found a picture on the internet and posted it on LinkedIn. The statement does not make any sense! But yet 420,105 LinkedIn members liked the picture, and 9,020 members gave some positive comment. No one wanted to see the contradiction between what integrity is – by its definition, and what the statement tells. So, let’s start from a definition (a very important step in a process called “scientific reasoning”). Nowadays, one does not have to run to a library to search for the meaning of words, Google will do just fine. So, integrity is an ability to stand up for your principles. Following the folk wisdom “Nothing is Good or Bad but, by comparison” the clearest way to define integrity is to compare it with conformity. 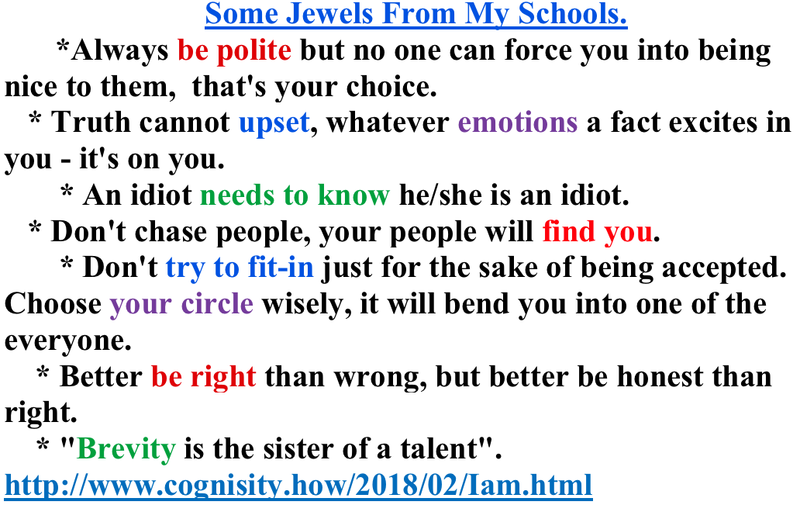 As we can see, integrity – as the opposite to conformity – is a capacity to act against social/peer pressure, not bending to common opinions, having your own criteria of your own actions. 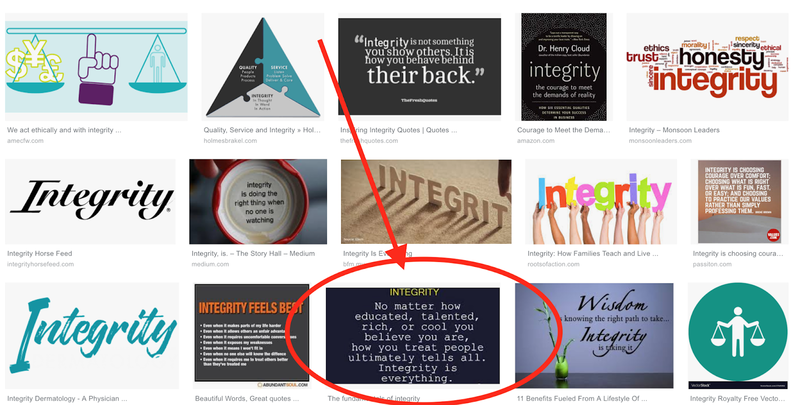 This quick linguistic analysis demonstrates that integrity has nothing to do with how you feel about yourself; integrity has nothing to do with how others feel about you. 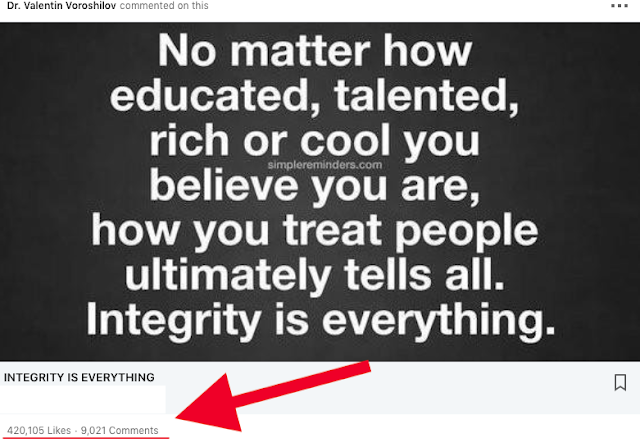 Integrity has nothing to do with feelings at all! And integrity has nothing to do with how you think about people or how people think about you. Integrity is about your actions. Period. Plus, term “treat” has numerous meanings, so in this context is useless. Of course, here it means “treat people in some nice way” (the opposite treatment would not be promoted, I suppose). But many people confuse “nice” and “polite”, despite the fact that “polite” and “nice” are two different treatments. 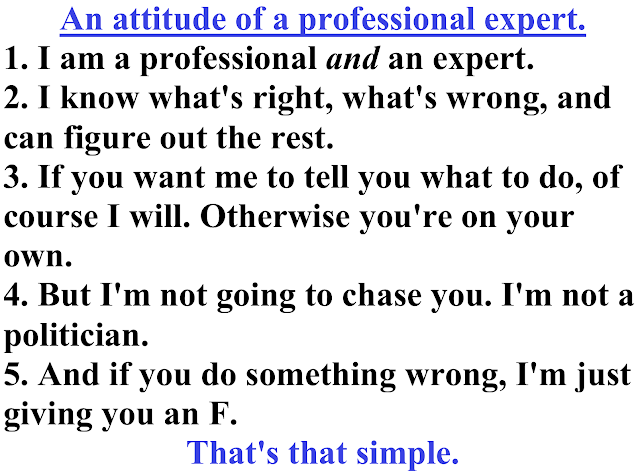 In real life, being nice and being professional may contradict each other, and that is not a very rare occasion. 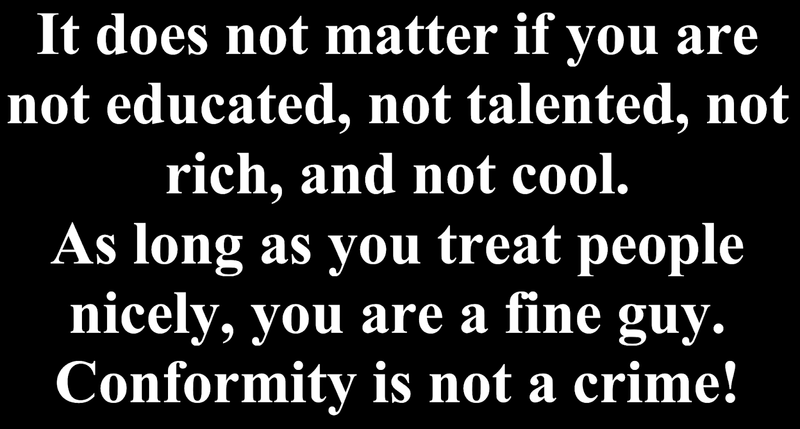 If you want to be judged based on how nice you are - you will lose your integrity really quickly. So, before adopting or liking a quote - maybe it's worth to spend some time to learn the meaning of the terms in it? Well, now we need to answer a different question: why have so many people “liked” the meaningless statement? This is a perfect example that demonstrates the immense Americans’ fascination with emotions and great Americans’ distaste with reason/logic (not all of them, of course, but many of those who have been born in America not very long time ago – by historic measures). The statement itself may have no meaning. But there is a hidden statement in it, that makes people feel good about themselves. The mind of a reader reads the original statement, but immediately uncovers the hidden one and the reader reacts – not to the actual statement – but to the hidden one (as I say to my students, our mind constantly plays tricks on us, and we don’t even notice them). 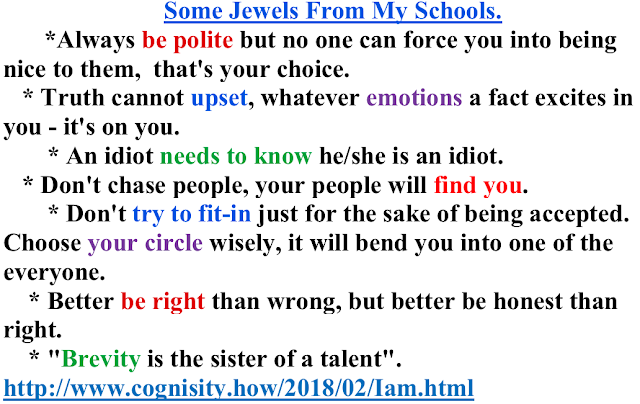 And that hidden statement says: “It does not matter if you are not educated, not talented, not rich, and not cool, as long as you treat people nicely (as implied) you are a fine guy”. This statement should be on the banner of everyone who can’t have a professional conversation if there is even a slightest hint of criticism in it. What Do All People Want? It was amazing to me see recently another instance of this fascination with emotions; this time it demonstrated how pathetically helpless people may be when emotionally attacked. It was a video where a young aggressive lady was attacking Chelsea Clinton. All Chelsea could do was to mumble “I’m sorry, I’m sorry”. I sent her a tweet, maybe it’ll help her to toughen-up a little. Today I would also add – Chelsea, have integrity! I also follow some simple rules my mentors taught me a while ago. “A Master is an expert professional. “Question always; question everything; question everyone”. 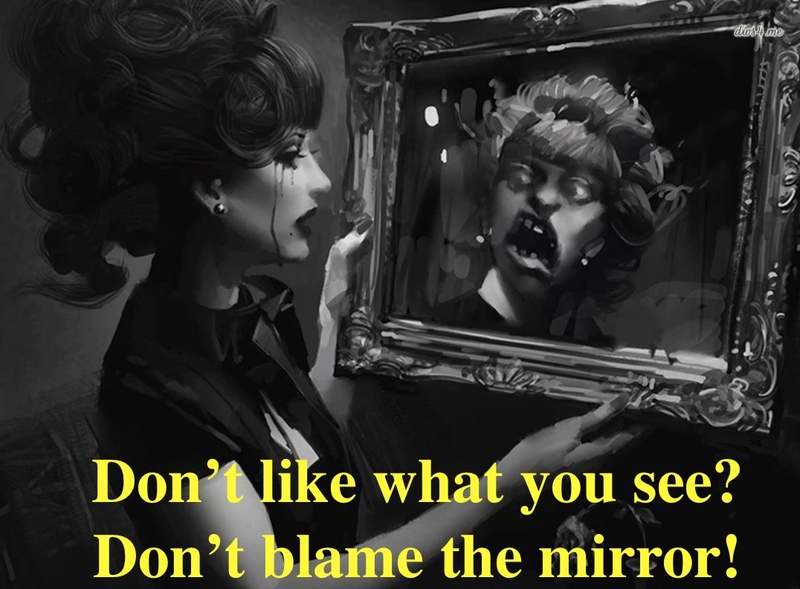 (BTW: a mirror is an object or a person interaction with which activates the process of reflection on (a) personal appearance; (b) external environment; or (c) internal psychological state). 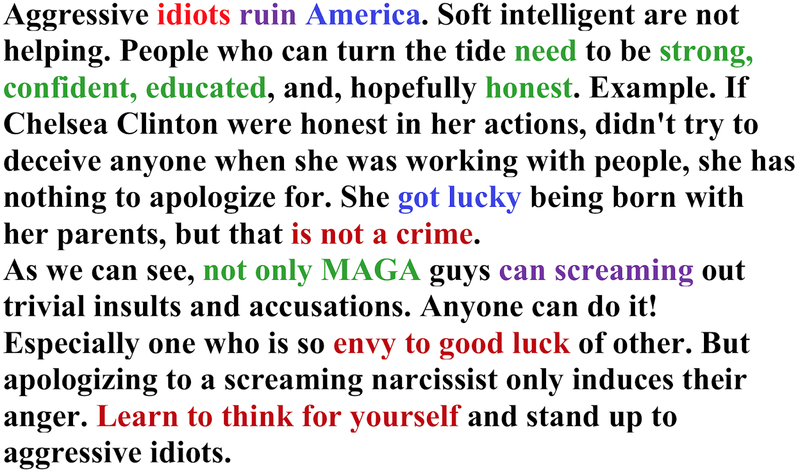 “There are people worse than evil geniuses: aggressive ignorants and arrogant idiots. Only good public education can bring their number down to a socially tolerable value”. Circling back to the title of this piece: when people focus on emotions, on the feelings, on what other people would think of them, they have no strength and energy to do things that matter, to do the right things. They have no ability to do what’s right. And they have no skills to think, to analyze the facts, to examine behavior of people around them and most importantly, to reflect on their own behavior. Hence, they do not participate in making things actually better, they do not participate in social progress. What they participate in is making people and themselves feel better. But making people fell better will never solve any social or professional problems – at least on its own. In result – economic and social problems compile, people are busy being deeply dug in their feelings, and little by little things are getting worse and worse.